The best backpacker's place in the Mexican Caribbean! If you go to the Riviera maya you can not miss Isla Mujeres and visit Pocna Hostel. Isla Mujeres is a small island (7 km) about 20 minutes from Cancun (by boat from Puerto Juarez). The hostel is only a short walk from the pier (6 blocks). We offer dormitories and private rooms (for our private rooms we only made reservations by email), with fans or A/C, and locker space. 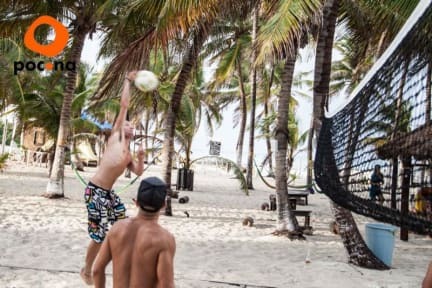 There is a cozy meeting area under a palapa with picnic tables, good music, privates parties with live music, board games, magic show and free activities for our guest like: yoga, meditation, spanish lesson, voleyball, salsa lesson ( these activities can always change). There is also and a sand garden with hammocks. We have a pool table (10 pesos per game) and a beach volleyball court (free!). The hostel has a restaurant/bar with a variety of food and snacks, and each evening we offer a different dinner special for a great price that always includes a free drink. At 11pm we open our beach bar (50mts from your bed and the sea). We offer some of the best prices for activities on the island: day-long adventure tours to Contoy Island; diving and snorkeling; bicycle, moped, and golf cart rental. Services included: breakfast, locker space (padlock is not included), sheets and pillow, wellcome drink, internet, wifi in lobby. Great Hostal near everything. Great dinner and party at night. I have to say it's only 3 blocks away from the best beach in Isla Mujeres and the party atmosphere is the best! However, the mattresses were the worst I've ever had in my life, I guess with a little investment in new mattresses it will be one of the best! Another downside was they do not have a kitchen or fridge for guests, the Kitchen cook (paid menu) was a lady who was always in a bad mood and answering badly to guests, nontheless food there was pretty good! Really great environment. Cozy hammocks in the yard. Live music most nights. Beds are pretty comfortable. Staff was very friendly. Breakfast is nothing to wake up for. Music goes pretty late into the night. Overall great little beach hostel to soak up the sun. I'm not really into the party hostel vibe, but I didn't find it too overwhelming here, and was able to sleep fine. Having a bar onsite is pretty convenient. Decently priced, edible food available from the kitchen which is also nice on a small touristy island where restaurants can be overpriced. I wish the rooms had screened windows or some kind of airflow besides AC and that breakfast started earlier than 8. Great atmosphere and location, definitely a lovely and fun hostel. The facilities and dorms are basic but serve the purpose. The hostel has a really nice location, especially the backyard where the party happens everynight. It is close to the beach, it is clean with nice people, however I found the staff kind of rude with way too many rules. One of the rules being that you cannot bring your own booze and they check you on the camera and kick you out! WTF? Also, please try to diversify the music for the parties during the night. Everyday you have the same genre with the same songs. Great hostel. Great location. Dorm rooms were dark and a little grimy, but the location and atmosphere was perfect. Would highly recommend to anyone who wants to meet great people and party. I hated my stay. The walls of the room were covered with dead mosquitos, the sheets were heavily stained, getting up on top of my bunk bed was almost impossible as the beds are tilting and there is nowhere to hold on. You can feel every move of the person below you (gets worse if it‘s a couple sharing the bed below you...). Breakfast is best to be skipped and the Tacos for dinner were the worst I’ve ever eaten. Would highly recommend to stay at Azucar Hostel - you can still party at the Poc Na. Security was concerning. When I woke up after my first (& only) night here, there was a man sleeping on the couch in the activity room, right outside my room, who didn’t have a Poc-Na bracelet. The facilities were dirty, especially the bathrooms, & trash was all over the acitivity room & out at the beach area. The late night beach parties I was prepared for; what I wasn’t prepared for was no implementation of quiet hours. People were yelling & playing ping pong right outside my room until 4 am.